When someone walks into a store only to walk out a few minutes later without buying anything, they’re likely gone forever. But not with the internet. No sir, we can tap into the ability to retarget them with visual display ads on Google, Facebook, and Twitter to name a few. If you’re on the edge of the fence trying to decide if remarketing is a good lead generation strategy, consider some of the following facts. With ads spread out over a number of platforms over the years, we’ve found Facebook and Google’s Display Network to offer the highest overall ROI. Google of course reaches extremely far with about 85% of the entire internet users reached at some point. Facebook has the largest active user base of any social network at 1 billion users interacting with it every day. Advertise to those who have abandoned a cart with an ad made especially for them. Show a specific ad for those who land on a service page. Rotate to a specific ad after a prospect left the landing page they hit from a different remarketing ad. And finally, if you end up on Facebook, remember that the clickability of your ad is directly responsible for the cost you pay to run that ad. The more Facebook users engage with it, the less you pay. So focus more on great creative rather than the technical and you should find success. First of all, remarketing clicks always cost the advertiser 2-100 times less than a search ad. Yet search ads convert clickers just about 10% more often remarketing ads do. So remarketers pay way less than search advertisers but receive 10% less clicks. That’s already a good deal, but it gets a whole lot better. And to drive this home, here’s a bit of our client data with the brands removed for privacy. Never, ever take for granted the opportunity remarketing gives you to leverage your brand. And it isn’t only about creating a positive brand image, there are actual numbers to support this claim. Generally a visitors stops by your site, then leaves and forgets your brand forever. But not when you’re using remarketing. To test this, we paused our branded remarketing campaigns for two months. After the time was up, we doubled down on the budget and let the campaigns run for two months. At the end of the period we noticed a 74% increase in searchers that directly typed in our website URL into their search bars. This proved that the brand recall for our company name was massively increased by remarketing. Here’s what we found after scraping data from thousands of different ads. The potential conversion rate of users who view an ad actually increases overtime as they see your ad multiple times. Here’s the data. 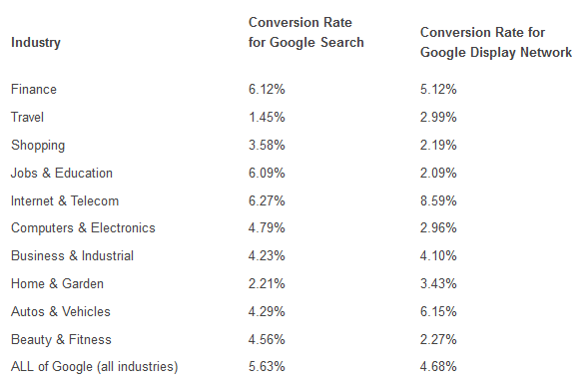 This shows that you’re generally safe to run ads up to the 6th or 7th impression for maximum returns. We set our frequency cap at 6. And remember, “ad fatigue” exists but the rumor of remarketing being creepy is incredibly overblown, as this data should show. Here, efficiency refers to the rate at which display ads fatigue vs the rate at which search ads fatigue. And as it happens, people tune out search ads a lot faster than display ads. Here’s the data. Important to note here is that you can rotate different ads to the same user, thereby negating the effect of ad fatigue. With the incredible opportunity the internet presents us to recapture lost customers, it’s simply up to the individual to accept and conquer remarketing. if you could remind every customer that’s walked out your doors only to completely forget about you that you still exist and can solve their problems – why wouldn’t you? There’s a lot more to remarketing than this though! Here’s more about the best practices of remarketing here.